The Krishna Institute of Medical Sciences (KIMS Hospitals), Kondapur, Hyderabad performed a challenging surgery on a 13-year-old boy suffering from congenital deformity of cervical and dorsal spine with multiple hemivertebrae. The marathon surgery was filled with risks of bleeding and neurological damage but was handled deftly by the team using 3D technology. The success brings focus on importance of identification of congenital disorders at a very young age in children. 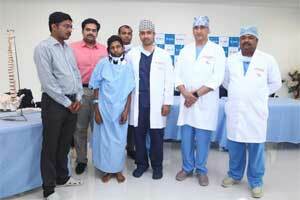 The boy, G Siva Prasad of Budwel, Hyderabad had been suffering with severe neck pain, a neck deformity since childhood. This deformity was noticed when he was five years old and was progressing since then without any respite. Siva would look dull always and was prone to depression identified after a regular general examination. The boy would not play much, nor was interested in spending time with his friends as a result of his physical appearance. The boy and his father had visited many hospitals since last 10 years without any hope of improvement. The worsening and growing deformity bringing more pain, fear and trauma also increased the risk of paralysis if left untreated. 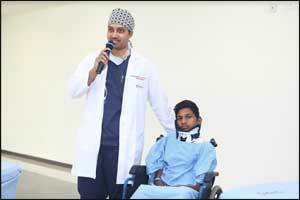 The boy was referred by a general physician to Dr Krishna Chaitanya, Spine Surgeon in KIMS Kondapur. A careful examination and investigation revealed congenital deformity of the cervical and dorsal spine with multiple hemivertebrae. After detailed discussion with the patient and examination, the child was offered surgery. Despite the high risk of neurological damage and bleeding which might result in irreversible brain injury, parents were happier to find a solution to their son’s illness. It was decided to operate on the child and the surgery was planned in KIMS Hospitals, Kondapur. Since this was an extremely lengthy surgery requiring foreign implants which are custom made, it would be quite expensive. The hospital authorities helped the child with necessary documents for CM Relief fund, and minimized the other expenses as much as possible. The surgery was planned by preparing a plastic model of the child spine by 3D printing and intraoperative neural monitoring technology to plan the screws and order them. The child was operated in two stages on the same day. It took 13 hours to complete the entire procedure and 80 % correction of the deformity was achieved. The boy recovered well and is now walking comfortably after the surgery. Parents were extremely happy and relieved of the burden they were carrying from last 10 years. Dr K Sri Krishna Chaitanya while explaining the disorder and its treatment said the deformities were very commonly seen in the society and should be identified in school screening programs to prevent progression to huge curves like the one in our example. “Ideally this child should have been operated when he was five years old, which would have been a much simpler surgery with less risk. The main aim of surgery is to prevent further progression of the deformity, which would make the child paralytic and prevent the lungs from expanding, so we have to remove the entire vertebrae which are abnormal. There are also very few case reports in literature addressing such deformities in the cervical spine,” he said.